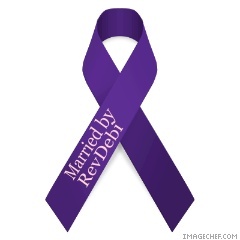 Grab your ribbon for your wedding page! The most common question I am presented with is that of the wording of the vows during the ceremony. As an interfaith non-denominational minister I can allow for any wording that affirms your commitment to each other. In light of this; you can use traditional wordings or you can write your own. 1. sit down with your partner and discuss what type of feeling you want your vows to evoke. Spiritual? Emotional? Celebratory? All of the above? 2. Make notes or tape record yourselves speaking the words. Does it flow,? Do you feel good saying those words? Will you be able to say them when nervous? Do you want the officiant to have you repeat them, or do you want a prompt card? 3. Do you want to include poetry or a little personal reading to your loved one? Have you overcome something together, like illness or adversity that you want to thank your partner for supporting you in? 4. Practice the words, and if any presentations are involved, test them for time and practicality, for instance gift giving involves a procession of people to the front. 5. Change it at the rehearsal. This is the time to see how it all feels, do not be afraid to edit. 6. Put it into practice on your big day, make sure everyone, including the officiant, knows where they should be, and if people do have to come up to you, that there is room for them. Children in the vow taking…some couples already have children. You can involve them in the vow taking to celebrate the making of a new family or the affirmation of an existing one. A couple of things to bear in mind; If you are not the only parents, it’s probably not a good idea to involve them in the vows, as their other parent/s may be offended. If you can, then ask for their opinion, if you can’t, then it’s best avoided. Some small children will be intimidated in front of a large crowd of people, and may not react as expected. Tears and wailing can definitely change the atmosphere. You’ll need an extra helper to coordinate the children, at the front of the gathering, a grandparent or someone else they are relaxed with. To avoid the Bride and Groom having to give orders/instructions and having to remove clinging shy small people from their leg during the ceremony!